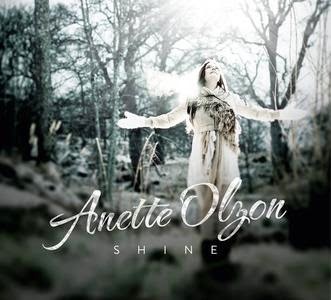 'Shine' is the first solo album of former Nightwish singer Anette Olzon. Although, the album was release in March, the composing and recording of some of the songs date back to 2009. It was after DPP world tour when Anette announced, that she's working on her solo album. But due to her second pregnancy, the release of the album was postponed. Prior to the album release, we got a tease in form of lyric video of 'Falling', followed by first single 'Lies'. Although 'Lies' and 'Falling' have rock sound, don't be fooled. 'Shine' mostly consists of ballads and slow songs. Songs that definitely let Anette 'shine' and you can tell, that this is her comfort zone. One thing that was a big surprise and a let down for me was the fact, that five out of ten songs were already played live or shared as demos. 'Floating', 'Invincible' and 'Falling' were shared with us on Anette's Myspace page. Although in form of demos, I dare to say that very little has change since 2009 when it comes to these three songs. Other two 'Watching Me From Afar' and 'Like A Show Inside My Head' were performed live shortly after Anette's departure from Nightwish. 'One Million Faces' was written by Martijn Spierenburg known as a keyboard player in Within Temptation. My second complain, and this is only my personal opinion, is a lack of challenging songs. Yes, Anette sounds very good on all of the songs, but most of them are just plain, sometimes boring songs, that you know right from the beginning what you're getting. An element of surprise is missing. I personally call 'Shine' a chill out album. Nice enough but not something I would expect after so many years of 'making' it.